Poster about the first project: Heartware for Malawi. Created for the open day at the Center for Advanced Internet Studies (CAIS) in Bochum, Germany. 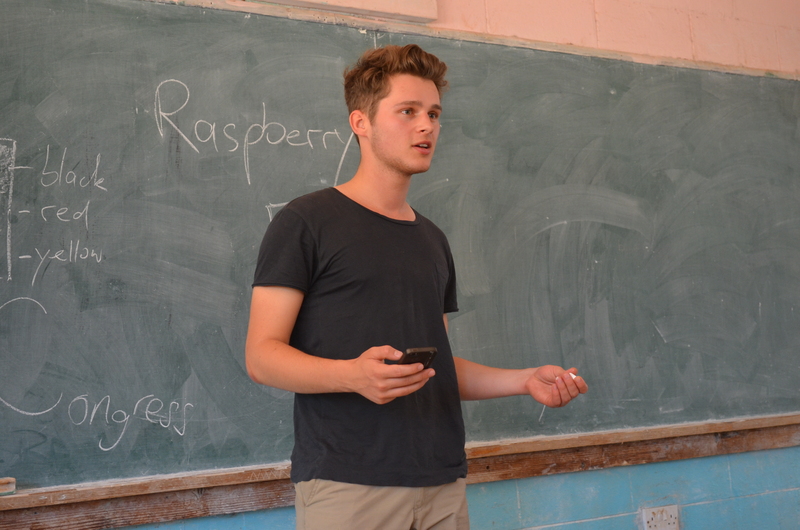 The first project took place in July 2016 at the Chaminade Secondary School in Karonga, Malawi. Chaminade Secondary School is the partner school to Edith-Stein-School in Darmstadt, Germany, from which Niels and Fred graduated in 2017. This school partnership is how we came into contact with Chaminade (read also: Who we are). This boys’ boarding school with 360 students has a library and computer lab. The majority of books is in a significantly bad condition. Because they are often donated, somewhere else discarded copies, their content is also out-of-date. A striking example is the atlas: It depicted the world before the end of the cold war, with Germany still divided into two states. The PCs in the computer lab are infested with viruses, massively hindering the use. An internet connection is missing entirely so that the lab was merely used for Microsoft Word, if at all. We wanted to draw on the existing hardware. In order to do that, we configured the PCs so that they were connected and able to cooperate. Subsequently, we connected those PCs with the Raspberry Pi that we brought from Germany. On the Raspberry, we had perviously stored a number of Wikis (Wikipedia, Wikibooks, Wikispecies, Wikinews, Wikiquote, etc.). The computers could now access the contents provided by the Raspberry Pi and thus the the computer lab was finally being used for research. With a introductory game, we tried to convey how to use Wikipedia for research: In the so called „wiki game“, the students were supposed to use the blue marked hyperlinks to jump form article to article and reach a certain article as fast as they can. For example: The student who could get from the article on Malawi to the article „Smartphone“ (using only the blue hyperlinks) first, would win. The students’ and teachers’ feedback on the opportunities of the technology we introduced was impressive. The deputy headmaster, Mr. Edward Luhanga, told us that he was „finally“ able to get further education (which could not be provided by obsolete books in the library). A group of students was eager to learn more about the technology. As a result of that, a computer club was formed — on the students’ own initiative. Despite the success, we were facing several problems during and after the installation (viruses, frequent black outs, speed of data retrieval). We have developed solutions in the meantime. Motivated by the positive reactions which we received from all involved in this first project, we wanted to conduct our project on a larger scale and give it an organizational structure. As a result of these plans, we founded Next Generation Africa e.V. at the end of 2016. The organisation has been officially registered in early 2017. It makes it possible to collect and receive donations for the project and gives us the opportunity to do proper public relations work as well as cooperate and exchange know-how with other organizations (e.g. solar energy projects for schools in developing countries). The organisation (as a non-profit corporation under public law) is also meant to give the project durability and sustainability.